Fun With Frisian: GAU - "quickly"
It giet sa gau as in mophûn in hynder opfrette kin. It's going about as quickly as a pug can devour a horse. It means "it" and is said with a schwa vowel. UHT. Giet is the third-person singular for the verb "to go," gean. Giet takes a long "ee" and a short schwa that might not be heard in speech. GEEuht. The infinitive is said with an "ih" as in "bit" and a schwa. GIH-UHN. Sa means "so" and is said with the long "ah" in "father." This is a very useful word and you will see it a lot in West Frisian. SAH. Gau means "quickly" as is pronounced with the "ou" or "au" vowel in "loud" or "gown." GAU. As, meaning "as" or "when," sounds much like the word "Oz" in English, but with a shortened final consonant. Hynder is West Frisian for "horse" and is said with a long "ee" vowel in the first syllable followed by a schwa in the second syllable. HEEN-duhr. 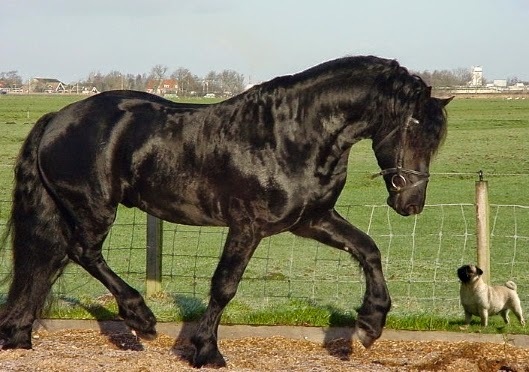 There is a special kind of horse called a Friesian or Frisian. 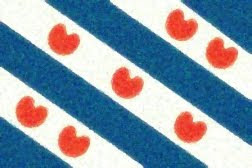 In Frisian itself, you call this breed a Frysk Hynder. FREEsk HEEN-duhr. Opfrette means "devour" or "eat up." The word comes from the preposition op meaning "on" or "up" or "upon" and the verb frette. Remember, op takes a long "oh" vowel, the same one we just saw in mop. Frette refers to animals eating or to humans greedily stuffing themselves, and can also mean "devour" or "bite." Think of the English word "fret" to remember it: when we worry or fret, that means something is eating at us. The Frisian verb is said like the English "fret" but the infinitive ends with a schwa. FREHT-tuh. Kin means "can" and is pronounced with the short "ih" heard in the English word "kin." The infinitive form is kinne, "can," "may," or "to be able." That is likewise said with the short "ih" and ends with a schwa. KIHN-nuh.